Another wonderful adventure with a new fairy friend! 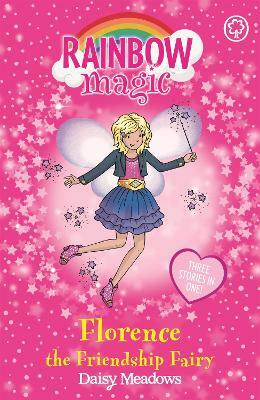 Florence the Friendship Fairy has a Very important job, she makes sure that friendships in Fairyland and the human world are looked after! But mean Jack Frost is jealous of everyone who has friends, as he's too grumpy to have any of his own. He steals Florence's three magical items (a memory book, a ribbon and a friendship bracelet) and hides them. Can Rachel and Kirsty find these items before their own friendship is threatened...? Daisy Meadows is the pseudonym used by Working Partners, the creators of Rainbow Magic and other successful series like Animal Ark.